Shomer MEOD et nafshecha... (guard well your life) this passage is commonly used to avoid "dangerous" situations. On Purim two friends killed one another and then they were brought back to life.. strange things happen to drunks... or do we have a lesson? Nefesh is the physical body, while neshama is the spiritual "body" (the goof is a goof). When a person dies we say "ha goof le malach ve ha neshama shel lach". This indicates a seperation between the body and the spirit occuring at the moment of death... but maybe there is never a seperation. MEOD is a name given by Saba to the "master of things". Shomer meod et nafshecha.. means to let the master of things guard that which is and will alwayse be his. Our bodies are not rented cars, they are TAXI CABS, we are not responsable for the driving or repairs, a Jewish man needs to sit in the back seat and concentrate on fulfilling his mission without taking too much responsability for the actions of his driver. This explains why Tzaddikkim do dangerous things in their avodat hashem and why the evil slaughtering of innocent martyrs is often called "kiddush hashem" sanctifying G-ds name. If the body had any value at all, these murders would be a great desecration of the name of G-d. The real world is ALL spiritual and all the reasons for NOT believing in NA NACH are material. 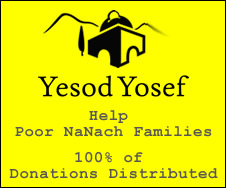 A NA NACH is completely fearless when he sees a spiritual need to act to promote the Tzaddik and spread the truth. Even to bring a single Jew closer by a hairsbreath for a single moment, Saba calls witnesses, that he is ready to sacrifice EVERYTHING. Yes the body isn't really worth it... heart of flesh...but the eternal soul's link to the head of all generations that is beyond priceless. See you there, hopefully. Amalek appears in Vayikra, it means "cutting the head" off the sacrificial small bird. That is him in three words "cut off head".